Anti-suffrage views dominated among men and women through the early twentieth century. The National Association Opposed to Woman Suffrage did not form until 1911. Opposing votes for women may seem surprising today, but anti-suffrage views dominated among men and women through the early twentieth century. Suffragists had national organizations since 1869, but anti-suffragists did not found their own group until 1911. Before organizing, suffrage opponents bonded without an official institution. Artists created political cartoons that mocked suffragists. Religious leaders spoke out against women’s political activism from the pulpit. Articles attacked women who took part in public life. Even without a coordinating institution, opposition to suffrage remained popular. In the 1860s, opponents of woman suffrage began to organize locally. Massachusetts was home to leading suffrage advocates, and it was also one of the first states with an organized anti-suffrage group. In the 1880s, anti-suffrage activists joined together and eventually became known as the Massachusetts Association Opposed to the Further Extension of Suffrage to Women. In 1911, Josephine Dodge, who also led a movement to establish day care centers to help working mothers, founded the National Association Opposed to Woman Suffrage (NAOWS). The NAOWS was most popular in northeastern cities. Like pro-suffrage groups, NAOWS distributed publications and organized events and state campaigns. Just like men and women supported votes for women, men and women organized against suffrage as well. Anti-suffragists argued that most women did not want the vote. Because they took care of the home and children, they said women did not have time to vote or stay updated on politics. Some argued women lacked the expertise or mental capacity to offer a useful opinion about political issues. Others asserted that women’s votes would simply double the electorate; voting would cost more without adding any new value. Where did formalized opposition to woman suffrage come from? How was woman suffrage a threat to society and culture? Illustration shows Uncle Sam and John Bull leading a group of world leaders walking in the center aisle between an exhibit of women suffragettes on pedestals; among the figures are "Mrs. Faith Healer," "Woman Evangelist," "Mrs. Lease" holding a large rake, and an elderly woman wearing a crown labeled "Queen of Holland Dames," as well as one woman labeled "D.A.R." Those identified are: "Dr. Mary Walker," "Belva Lockwood," "Susan B. Anthony," "E. Cady Stanton," "Mrs. Eddy Christian Scientist," and "Carrie Nation of Kansas" holding a large ax. This pamphlet was distributed by the National Association Opposed to Woman Suffrage. It contained reasons why women did not need to vote; for example, it suggested women did not want to or care to vote, because it would “mean competitions of women with men instead of co-operation,” and because “you do not need a ballot to clean out your sink.” Many women found these ideas rather offensive; however, there were some who did agree with them. In addition to the anti-suffrage language, the pamphlet caught women’s attention with its title “Household Hints” and inside there was useful household advice. These suggestions, like “Sour milk removes ink spots,” provided women with easy solutions to common issues while also encouraging them to not “waste time, energy and money” by voting. This political cartoon was created in 1912 by Laura Foster and shows her views towards suffrage. Illustration shows a group of men and women marching under such banners as "The Lips That Touch Corn Likker Shall Never Touch Ourn", "W.C.T.U. ", and "Carrie Nation Cadets", with one man carrying a small barrel labeled "Vegetable Tonic", and a large wagon labeled "Water Wagon No. 1" immediately behind the leaders, to show their support for prohibition. They are all colored blue. 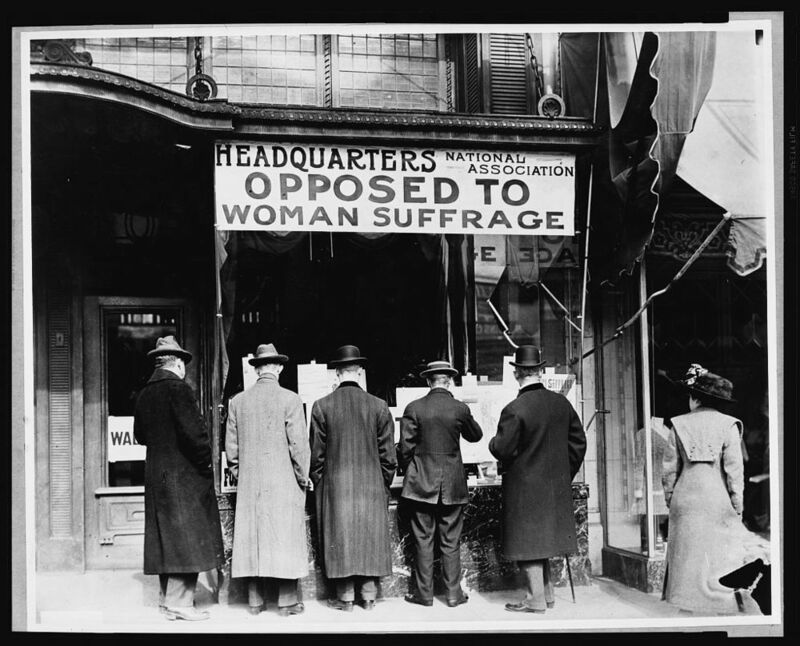 Photograph shows men looking at material posted in the window of the National Anti-Suffrage Association headquarters; sign in window reads "Headquarters National Association Opposed to Woman Suffrage". Caricature of Frances "Fanny" Wright, British-born activist, exponent of female suffrage, and outspoken critic of slavery. The title's reference to Wright as a "gabbler" probably alludes to her sensational American lecture tour of 1829. Wright wears a black dress and long white scarf, and has the head of a goose. She stands reading from a book and gesturing, before a speaker's table with candles, pitcher, glass, and books. Behind her stands a young man, holding her bonnet and looking on. Mrs. Kemble's costume and the scene itself -- with its table, water, candles, and acolyte-like attendant -- seems intended to suggest an underlying parallel with liturgical rites. This petition was sent to the United States Senate and includes the names of women opposed to women’s suffrage in 1917.